High water common ground - (video) Feature Documentary exploring Natural Flood Risk Management, and the communities at the heart of it all. Community Guide to Water Management - Action with Communities in Rural England (ACRE), the Farming & Wildlife Advisory Group (FWAG) and the Countryside and Community Research Institute (CCRI) have produced a Community Guide to Your Water Environment aimed at engaging parish councils and local community groups in catchment management. Holder of species data for Sussex. Produce reports to highlight key habitats and species in your area. Natural water retention measures are measures that aim to safeguard and enhance the water storage potential of landscape, soil, and aquifers, by restoring ecosystems, natural features and characteristics of water courses and using natural processes. 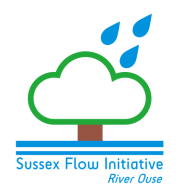 A partnership of organisations working in the Ouse and Adur river catchments. Developing projects and unifying work across the catchment. Lead charity in restoration and monitoring of local rivers and related habitats. Transition Town Lewes (TTL) is a voluntary organisation with many dedicated people offering their time, effort and knowledge to help make Lewes a thriving and sustainable community. Brighton and Lewes Downs Biosphere. ​The newest UNESCO Biosphere, right here on your doorstep. The Stroud Rural SuDs project is an innovative Natural Flood Management project working to reduce flood risk and restore biodiversity throughout the catchment of the River Frome and all its tributaries, including the (Slad Brook, Painswick Stream, Nailsworth Stream, Ruscombe Brook and all their named and unnamed tributaries). Landowner led project to protect and enhance soils and landscape through addition of trees, hedgerows and other measures. Clear benefits for the landscape, soil protection and flood peak reduction. techniques to slow and store water in the landscape. Natural Flood Management project using woody dams and other NFM features to reduce flood peak in Pickering. The project has focused on using natural processes to slow the water down in catchment of the rivers Aller and Horner. This project aims to allow the evolution of Ennerdale as a wild valley for the benefit of people, relying more on natural processes to shape its landscape and ecology.